But if you’re registered in one of Apple’s developer programs, you may be able to jump forward in the queue to get an Apple Watch. 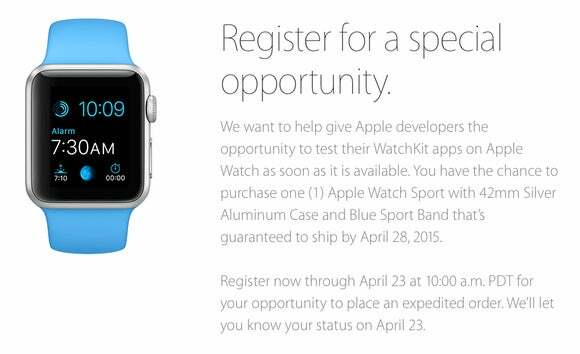 The company sent email on Tuesday to developers teasing a “Special Opportunity for an Expedited Apple Watch Order” that could mean a guaranteed ship date of April 28 for a 42mm Silver Aluminum Case and Blue Sport Band—if you’re chosen. Quantities are limited, as expected, so developers who register at Apple’s website between now and April 23 at 10 a.m. Pacific will be entered into a drawing enabling them to purchase that model. Apple will notify the chosen few (or perhaps chosen many—we don’t know how many devices this special program covers) on April 23.